Written by Janet Choi on September 14, 2017 . Here is one of the classic SaaS growth problems: customer care and communication isn’t evenly distributed. A high volume of self-serve customers is what allows business to scale — this is baked into the growth strategy of most SaaS companies. But in the face of the constant challenges of growth, including the ever-present threat of churn, companies often end up building up account management to attract and better retain customers, especially larger accounts. That’s where you find the communication and care imbalance. A certain subset of customers grabs all the attention. One big enterprise customer can cover the salary of one account manager, and with that kind of math, it’s hard to dedicate equal time to customers who pay $50 a month versus those who pay $5,000. But that doesn’t mean you should throw up your hands when it comes to all your smaller, self-serve accounts. Larger customers pay the most but also tend to be resource-hogs, with a penchant for custom demands. When it comes to smaller customers: there’s a lot more of them and their lifecycle journeys tend to be more predictable. Programming your customer communication to provide care at scale is the smart way to increase profitability while providing a great experience for every customer, regardless of their contribution to MRR. Here are a few steps towards mixing automation magic into your customer care and account management with helpful lifecycle emails. When it comes to your self-serve customers, you’ll probably find some element of predictability. They have similar goals, sizes, and acquisition paths into your business. If you look closely at user behavior by pricing cohort, you might find that the deviation from the mean is small. This makes scaling a baseline of account management more straightforward than you might think. sample user behavior patterns When you identify the points at which self-serve customers run into trouble, create automated messages to trigger at those points to smooth out friction and help people make progress. Timely messages feel highly personal since they address problems that are top-of-mind. A truly great automated account management message would also be prescient — because you can anticipate problems before they happen, you can swoop in to save the day at just the right moment. You hear a lot in the e-commerce space about the power of cart abandonment emails. Something like 57% of all carts are abandoned. Imagine if we had a way to tie abandoned tasks in SaaS directly to lost revenue. Customers who try to create that project, upload contacts, or whatever your Aha! activation event is — and fail — are way more likely to churn. As a rule, don’t let customers abandon key tasks without a follow-up. These are some of the easiest messages to automate, and they create a custom-feeling experience for the user. Again, the type of message personalization that matters has more to do with timing and relevant copy rather than merging in a first name into the text and subject line. Identify a few vital onboarding tasks for your customer and if people fail to complete them, make sure they get an email with the help they need. Your path to revenue is made of completed tasks. The ad retargeting platform AdRoll, for example, automatically sends a recurring email of monthly metrics to its customers. The email rolls up the customer’s ad campaign performance from the past month, including key metrics like conversions and ROI, providing customers insight into their progress in the platform. 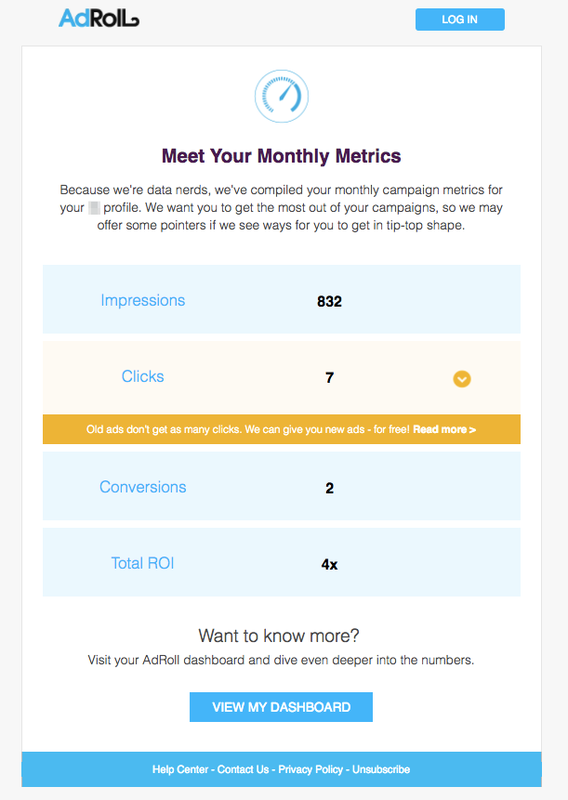 This monthly email also uses Customer.io‘s conditional Liquid templating logic to show different suggestions for how to improve campaign performance depending on the various metrics. For example, this customer’s digest reports a relatively low number of clicks. So the email includes a tip that older ads tend to not perform as well. Max Blaha, who manages growth at AdRoll, was inspired by the recurring digests sent by Zapier — and sees this type of communication as a way to “make sure that our off-line experience matches our in-app experience.” That way, AdRoll can continue to engage and provide value to customers without having to make them remember to log in regularly and check their stats. Thoughtful approaches like this around the customer experience checks out in the business numbers — AdRoll has a 97% customer retentation rate. So while you may find that sending emails like this leads to people logging into their accounts less, that’s okay. You’re creating a better experience for them. Send a few great account-related emails throughout their entire lifecycle. Autoresponders leave people hanging once they end, but a few smart (and automated) updates will make your product more accessible. Blend personal emails (”Hi, I’m Tony from customer success…”) and account emails (“You used 71% of your quota this week”) to land in the inbox and initiate engagement in the form of responses with feedback and questions. You can greatly increase customer touch points if you increase variety along with thoughtful volume. Start with one thoughtful interaction. Yes, one will do the trick. Try using a tool like Bonjoro to welcome new users with a video or automate a campaign to send out swag. If you make the effort to communicate with all customers early on, customers will be more apt to read and act on the automated communication you send later. The truth is that lifecycle account management is low-hanging fruit. Creating these messages will force you to understand your customers better and find all of the friction in their experience. Done well, it amplifies one of the chief growth mechanisms — volume — that exists in the SaaS model. Over to you! What do you think about harnessing lifecycle emails to provide smart, automated customer care?